Tom Brown’s TGB Promotions and Lou DiBella’s DiBella Entertainment put on a televised card on Fox Sports live from the MGM National Harbor, Oxon Hill, MD. This event was promoted in conjunction with Al Haymon’s Premier Boxing Champions (PBC). The main event featured an upset by Sergey “Samurai” Lipinets by Lamont “Havoc” Peterson in ten rounds. Afterwards Lamont announced his retirement. Tom Brown’s TGB Promotions and Showtime featured 3-division world champion Mikey Garcia winning his fourth division title defeating IBF World Super Lightweight Champion Sergey “Samurai” Lipinets in the main event. The event was held at the Freeman Coliseum in San Antonio, TX, Saturday night. 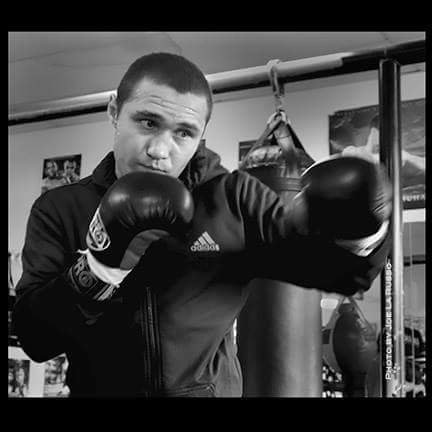 IBF World Super Lightweight Champion Sergey “Samurai” Lipinets, 13-1 (10), of KAZ, and Beverly Hills, CA, lost his title to the former WBO Featherweight, Super Featherweight and WBC Lightweight Champion Mikey Garcia, 38-0 (30), of Moreno Valley, CA, over 12 rounds. In the first round almost a minute went by with little connecting. There were mostly jabs by both boxers with Garcia landing a couple of combinations. In the second round Lipinets does a lot of feinting and using the jab. Garcia landed several chopping rights to the head. With a minute left in the round Garcia rocked Lipinets with a right to the chin. Garcia had a bloody nose. In the third round Lipinets opened up rocking Garcia who came right back with combinations. Lipinets kept his left hand low while Garcia had his up high. In the fourth round Lipinets landed an overhand right to the head. Referee Lawrence Cole warned Lipinets for a low blow. Garcia landed a lead right to the chin. In the fifth round Garcia landed a triple left hook. Midway Lipinets landed several left hooks to the head. Garcia countered well. Lipinets ducked into a Garcia left hook. In the sixth round Garcia used his jab well. Lipinets landed a straight right. Garcia came back with a solid right to the head. Garcia landed a combination but got countered by a Lipinets left hook to the chin. In the seventh round Garcia landed a chopping right and got countered by a right. A counter left hook by Garcia dropped Lipinets at the midway point of the round. Lipinets was up at eight and cut on the left eye brow. In the eighth round Garcia landed a lead right to the head. Lipinets drove Garcia against the ropes with a flurry of punches. Garcia landed a hard right to the chin just prior to the bell. In the ninth round Garcia boxed well for the first half of the round. Lipinets landed a right followed by a left hook driving Garcia back a few steps. In the tenth round Lipinets kept the pressure on Garcia. At the midway point Garcia rocked Lipinets with a lead right to the chin. Lipinets missed a right and was countered by a Garcia left hook. Garcia ended the round with a right cross to the head of Lipinets. In the eleventh round Lipinets landed a hard left hook to the head of Garcia. Lipinets came back with a combination to the head. Garcia landed several lead right hands to the head. Both boxers landed left hooks to the head. In the twelfth and final round Lipinets was looking for a knockout seemingly behind. Lipinets landed a solid left hook to the chin. Both fighters left it out in the final minute of the fight. Judges scores Mark Calo-Dy 116-111 and Julie Lederman and Nelson Vasquez 117-110. This writer had it 116-111. “I want to thank the beautiful fans in San Antonio for their support. He was very strong and prepared. There were moments I felt I may have hurt him but didn’t want to chance getting hit with an overhand right. I would like to go back to lightweight and unify and back to super lightweight and unify,” said Garcia. “I thought his experience won him the fight,” said Lipinets. In a rematch the former IBF World Featherweight and IBF World Super Lightweight Champion Cuban Rances “Kid Blast” Barthelemy, 26-1 (13), of Las Vegas, NV, lost in a lopsided decision to the new champion Kiryl “Mad Bee” Relikh, 22-2 (19), of Minsk, Belarus, for the vacant WBA World Super Lightweight title. In the first round Barthelemy with hands held high kept moving as Relikh chased. Relikh landed combinations when he was able to catch up with Barthelemy. Barthelemy ended the round with a pair of body shots. In the second round Relikh had Barthelemy on the ropes landing have a dozen unanswered punches. In the third round Relikh landed more than half a dozen punches keeping Barthelemy on the ropes. Barthelemy landed a combination to the head of Relikh while in the middle of the ring. Relikh landed the best punch of the round a solid right to the head of Barthelemy. In the fourth round Barthelemy stayed in the middle of the ring quite a bit and got out punched when he did. Not much jabbing in the fight as both fighters are head hunting. In the fifth round Barthelemy was warned about a low blow by referee Luis Pabon. Relikh got through the defense of Barthelemy with uppercuts and straight punches. In the sixth round Barthelemy landed a left hook to the head but got countered by Relikh with his left hook. Barthelemy forced by holding Relikh to go backwards into the ropes and to the canvas. Relikh continued to outwork Barthelemy. In the seventh round for the third time in the fight Barthelemy warned for low blow and deducted a point. That didn’t stop Relikh from out landing him. In the eighth round Barthelemy landed a 3-punch combination to the head of Relikh. Relikh used a jab and left hooks with chopping right hands to body and head of Barthelemy. In the ninth round Barthelemy fights in spurts while Relikh lands heavy handed punches. Barthelemy “shoe shines” at the end of the round trying to steal the round in the judge’s eyes. In the tenth round Relikh continued out working Barthelemy. Half way through the round both fighters were throwing punches at each other to the first delight of the fans. What may have looked like a good body punch by Barthelemy was low. A left hook by Relikh to the head of Barthelemy was countered with a flurry of punches. In the eleventh round only in spurts does Barthelemy land left hooks to the body of Relikh. Barthelemy’s style is not entertaining to the fans and shouldn’t be to the judges. In the twelfth and final round Barthelemy switches from orthodox to southpaw and back. Relikh landed a double left hook to the body. Barthelemy comes forward but not throwing many punches as Relikh countered well. With five seconds to go once again Barthelemy lands a low blow and loses another point. It looked like a shut out for Relikh but since their first fight did and he lost you never know with judges. Judge Palacano 118-109 Judge Ramos Judge Montoya. This writer had it 120-107. “The difference this time was I did it with my new trainer. I am very happy and dreamed of this and now it is done,” said Relikh. This Saturday will be another stacked night of boxing with two competing cards on Showtime and ESPN. Showtime will be presenting two world title fights at the Freeman Coliseum in San Antonio, Texas with Mikey Garcia (37-0, 30 KOs) looking to capture a fourth world title in a fourth weight class when he challenges IBF Jr. welterweight champion Sergey Lipinets (13-0, 10 KOs) in the main event. Garcia is looking to become just the third fighter in history to capture world titles from 126 pounds to 140 pounds if he is successful in defeating Lipinets this Saturday night. 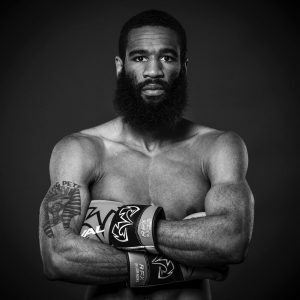 Garcia is considered by many in boxing to be one of the best pound for pound fighters in the world and will be heavily favored to defeat Lipinets. While Garcia is certainly a very skillful fighter with boxing skills, punching power, and excellent technique, there is still a strong debate on whether Garcia is truly one of best in the world pound for pound. 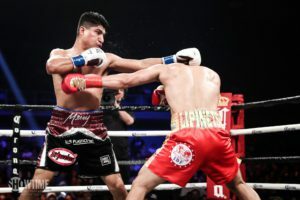 Garcia is a three-weight world champion but with Adrien Broner being his career best win to date, there is much left to be desired in the career of Mikey Garcia. 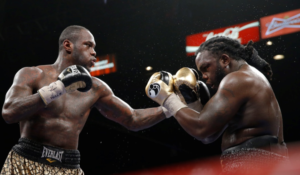 The 30-year-old Garcia losing two years of his career while he battled his former promoter Top Rank in court didn’t help matters when it came to his rise in the sport. Still, in his three fights back since his hiatus from the sport, he’s reminded the boxing world how good he is, but can he fulfill his career ambition in becoming one of the biggest names in the sport? Reportedly turning down a Miguel Cotto and Jorge Linares fight to instead fight an unknown but dangerous champion in Sergey Lipinets may not seem like the smartest of business decisions. However, Garcia is happy with the path he’s taking, will look to make history against Sergey Lipinets, and will eventually set his sights on challenging one of the welterweight champions if he is successful this Saturday. 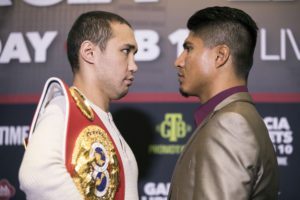 Lipinets will be looking to spoil all of the plans of Mikey Garcia and frankly he feels disrespected with all the talk of Garcia picking up his fourth world title. Lipinets though is very confident of victory and while he may be an unknown champion, he is a good strong fighter with a lot of experience as a kick boxer and has fought very solid opposition in just 13 pro fights as boxer. An argument can be made that Lipinets could be Garcia’s most interesting challenge to date. On the undercard, features another world title fight in the 140 pound weight class when Rances Barthelemy (26-0, 13 KOs) takes on Kiryl Relihk (21-2, 19 KOs) for the vacant WBA super lightweight title in a rematch of their wild fight last May. The winner of this fight will put themselves in a strong position for a unification bout with the winner of the Garcia vs Lipinets main event. There were complaints that Friday’s PBC card on ESPN appeared to be pretty much the same as an old Friday Night Fights broadcast. For those who don’t know, Friday Night Fights, ESPNs boxing program of old, featured up and coming boxers and gave them international exposure. The PBC, on the other hand, was supposed to bring major bouts to “free” television. Needless to say, ESPNs PBC card on Friday featured up and comers rather than huge stars. So yes, the broadcast did look like an old FNF show. Truth be told, however, I always loved FNF, so I settled in for a fun night of boxing. The evening showcased a Mongolian fighter who boasted a 5-0 record, all by knockout. Sure enough, Tugstogt Nyambayar stepped into the ring at the Horseshoe Casino in Tunica, Mississippi as a featherweight who was off to a thunderous, if not high profile, start. His opponent, Rafael Vazquez, hadn’t fought since dropping a unanimous decision to Ryan Kielczewski the previous October. Still, with 13 knockouts out of 16 victories in a record consisting of 19 fights, it was clear Vazquez was more than just cannon fighter. Unfortunately for Brooklyn’s Vazquez, Nyambayar kept up his knockout streak by crushing his man in round one. The main event, which featured 9-0 junior welterweight Sergey Lipinets facing off against Nicaragua’s 26-3-1 Walter Castillo. With a rich background in MMA and amateur boxing, Lipinets was clearly looking to improve his resume -which featured seven knockouts – with a sharp performance. Castillo, however, was known to be a high energy foe. After having one win, one loss and one draw in his last previous fights, Castillo would earn the career boost he needed with a win over the rising Kazakh. Lipinets took to Castillo with his heavy fists early on, but Castillo remained game. Lipinets split his man’s lip in the third as his hard shots gave him an edge. Castillo, however, was not to be denied so quickly, for he started the fourth with a harsh assault on his foe. Sure enough, the fight started to even out. What’s more, Lipinets suffered a cut due to a clash of heads. Lipinets nailed his man in the 6th so effectively that it looked like the proceedings might be coming to a close. Castillo survived, though, and remained competitive. Still, Lipinets connected with thunderous precision again in the seventh before banging Castillo against the ropes. Not one to relent, Lipinets swung away until Castillo began to look helpless, leaving the referee no choice, but to stop the fight.